Norwegian Cruise Line Holdings Ltd. on Nov. 19 has completed its purchase of Prestige Cruises International Inc., parent company of Oceania Cruises and Regent Seven Seas Cruises. The $3.025 billion transaction in cash and stock included the assumption of debt. 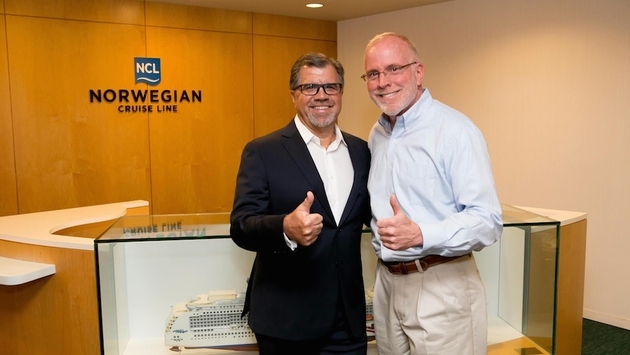 The acquisition catapults NCLH into the upper-premium and luxury cruise segments with two well-established and successful brands in addition to its original contemporary brand, Norwegian Cruise Line. The move also lets NCLH compete more successfully against its massive competitors, Carnival Corp. and Royal Caribbean Cruises Ltd., which offer a portfolio of brands spanning the market segments. The combined cruise company now operates 21 ships with approximately 40,000 lower berths visiting more than 430 destinations worldwide. Five new ships are on order for delivery through 2019. Sheehan has said that synergies and sharing best practices will save the new company at least $25 million. Under the new organization, Sheehan will head NCLH, the parent company, and Prestige CEO Frank Del Rio, who co-founded Oceania in 2002, will remain in that position at least through 2015, he said previously. Kunal S. Kamlani will remain president and COO. With Sheehan’s expanded duties, Norwegian Cruise Line hired a chain restaurant executive, Drew Madsen, to serve as president and COO of that brand. But, agents said they hope that Oceania and Regent will keep their own unique personalities and positions in the marketplace. Sheehan and Del Rio vowed to keep the brand positioning. “We are committed to maintaining three distinct brands and this will flow into all of our operations,” they wrote in a letter to travel agents after the deal was announced.